So, here’s the thing, I LOVE a little coffee in my life, but maybe not a cuppa every morning. I mean, there’s something really, really special about the smell of coffee first thing in the morning when you wake up. But that doesn’t mean I’m running down the stairs to grab my favorite mug. No, I have so many crazy-creative ways of getting my favorite caffeinated fix. And, to showcase my new coffee-obsession at my Coffee-n-Cupcake party, I made Vanilla Cupcake Coffee Chocolate-Covered Pretzels…so good. So perfectly yummy. And so coffee-filled. I just…I just can’t even. 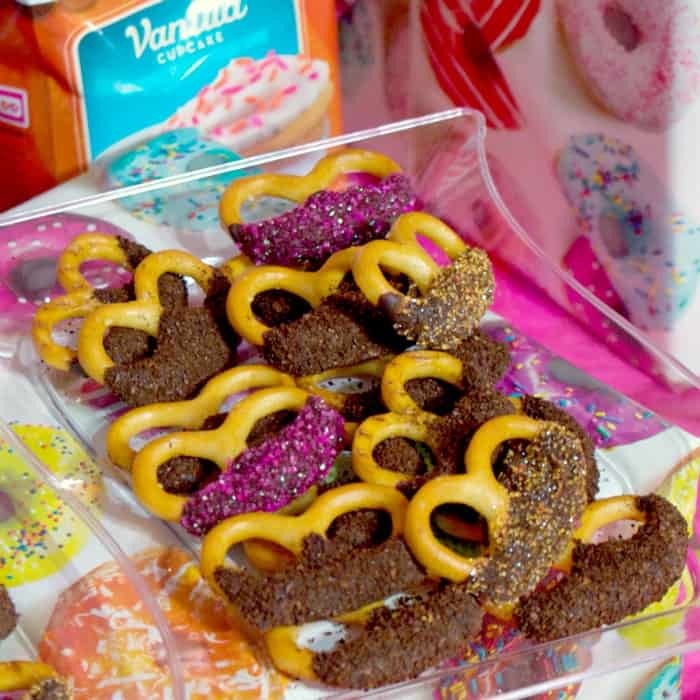 I would like to say that all of the Vanilla Cupcake Coffee Chocolate-Covered Pretzels made it to the party table. But no. No, I managed to eat a half-dozen (or more) of these delectable treats the night before. Sorry, party guests, you will not be enjoying them ALL. I got my fill before I even got them to the party table. Heh. So, be sure to check back tomorrow for pics of the party. This is totally a “sneak peak” since I’m throwing it today. I really hope my guests enjoy these pretzels. Well, maybe I hope they don’t enjoy them too much–because I GET THE LEFTOVERS! LOL! 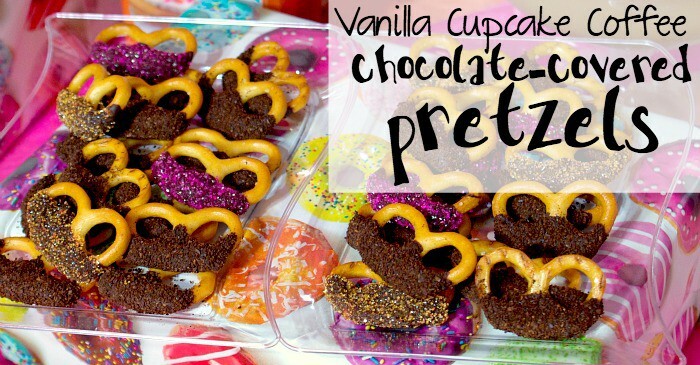 to showcase my new coffee-obsession at my Coffee-n-Cupcake party, I made Vanilla Cupcake Coffee Chocolate-Covered Pretzels...so good. So perfectly yummy. And so coffee-filled. I just...I just can't even. Please note my recipe can go either way, but I did make these with gluten-free pretzels and dairy-free chocolate. So, mine were allergy-friendly...yours don't have to be, but there's that. Heh. Have a baking sheet or plate nearby. Place the coffee grounds in a small bowl. Set aside. Place the chocolate in a microwave-safe bowl and microwave in 30-second increments, stirring between each increment until the chocolate chips are melted and smooth. Open the pretzels and remove all the pieces that are broken or otherwise not "perfect" (I ate all mine...heh). 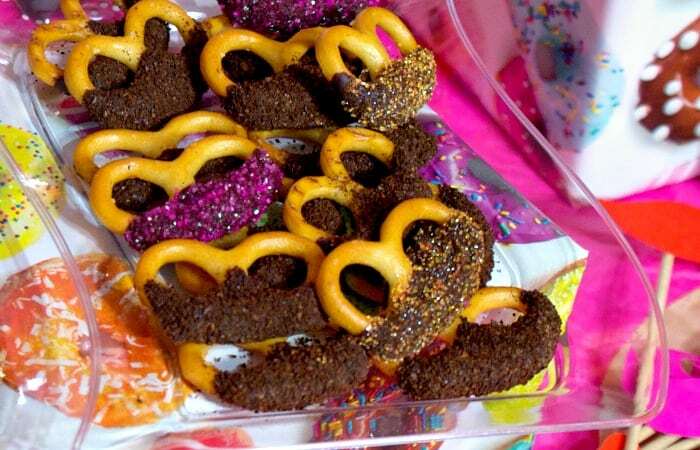 Dip the bottom half of one pretzel in the chocolate. Immediately dip the chocolate-covered portion into the coffee grounds. Set pretzel on the plate, then continue with all of the pretzels you have slated for covering. 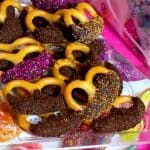 Place pretzels in the refrigerator for approximately 10 minutes to allow the chocolate to set. Now, place your pretzels on the table and RUN AWAY! Because your guests are going to rush the table for seconds...heh.